Are you ready for a true-north experience? Leaving Wawa, heading toward Thunder Bay, Transcanada #17 turns away from the shore of Lake Superior, and travels over the high plateau of Canadian shield country, past Chatanga and White Lake Provincial Parks, to the west of Pukaskwa National Park with its vast wild shoreline, through the communities of White River, Mobart and Hemlo to Marathon and Terrace Bay. In this land, rivers flow toward Lake Superior, shallow in some places with sandy shores, fast moving in other sections as they race over rifts of bedrock. Cool waters flow under moss- covered branches then spread out as the river feeds bogs and fens; but always racing toward the Lake. Near Marathon, the highway catches up with Lake Superior again, with its mountainous shoreline and deep valleys, one of them the Little Pic River Gorge. Stop just before or after the bridge and walk to the middle of the span for great views of soaring bare rock walls. Terrace Bay takes visitors completely by surprise. Built in 1947 as a planned community on a series of terraces that step up from the lake, the town is a time capsule of mid-twentieth century architecture. C1950's Simcoe Plaza is an architectural gem. Terrace Bay has an excellent Information Centre, located in the heart of the community on Highway #17. Stop in for up-to-date visitor information. 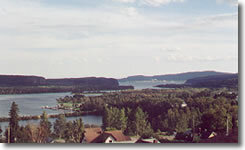 Great views of town, lake and islands can be had from the top of the rock bluff behind the Centre. If lucky, you’ll see several bald eagles that claim the cliffs as their territory. Plan to spend at least two days in the Terrace Bay area so that you can take a boat tour of Slate Islands Provincial Park, a group of seventeen isles that are eight miles off-shore. Lake Superior can be rough and unpredictable but Captain Doug Caldwell of Caribou Charters and his staff, read the lake like a book. With cool, moist climatic conditions, flora and fauna on the islands is unique and usually seen one thousand miles north in Canadian tundra country. The islands boast a Woodland caribou herd of close to 350 animals whose ancestors crossed from the mainland on winter ice in 1907. 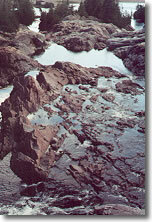 The Slate Islands aren’t comprised of slate, but do have a unique geological make-up. It is thought that the ring of islands once had a volcanic centre and were formed when a meteorite struck the area millions of years ago. Ask your tour captain to show you the largest shatter cone found to date, in the world. 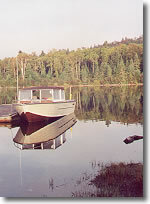 There are a number of secluded sand beaches with black spruce growing to water’s edge throughout sheltered inner-island waterways. Look sharp for unusual rock formations, caribou and eagles. It’s imperative that tour reservations be made in advance of any trip to the islands. Most people don’t come prepared to send time on the islands but do enjoy a tour around and between them with a knowledgeable guide. Terrace Bay’s boat launch is at Aquasabon Beach from where you can access the Casque Isles Hiking Trail. Going north, the trail crosses the lower end of Aquasabon River as it spills into Lake Superior and follows a forest path lined with a wide variety of wild flowers, mushrooms, mosses and species of tree. The marked trail leads down to sand and cobblestone beaches with great views of the lake. Watch closely for otters. Casque Isles Hiking Trail is approximately 32 miles long and divided into different sections, some at a more difficult hiking level than others. Like to play golf? The road to the beach and hiking trail, goes through Terrace Bay’s golf course, an excellent nine hole course run and maintained by volunteers. The Imperial Motel, on Highway #17 in downtown Terrace Bay is a nice place to spend the night. Drifters Roadhouse is part of the motel complex and serves good food at reasonable prices. Try their deep fried olives. Join local folks for a hearty breakfast at Terrace Bay Family Bakery in Simcoe Plaza. The smell of fresh baked bread, first thing in the morning is a real appetite enhancer. Back on the road again, head west through Schreiber, Rossport and Gravel to Nipigon with its sheltered bay, protected by the Black Bay Peninsula and St. Ignace Island. Along the way, there’s more spectacular scenery - Lake Superior on one side, soaring flat topped mesas on the other. The road is lined with interesting lit-par-lit rock formations of white limestone, red sandstone, mudstone with siltstone or white quartzite with mudstone. Impressive and hard for a rockhound to resist! High mesas and cuestas that rise from both lake and shore rival those in the southwestern U.S.A. It’s interesting to note that both the Schreiber and Nipigon areas have ancient Native pictograph sites. At Nipigon, Transcanada #17 meets Transcanada #11 - a more northern route. Before continuing west, drive for approximately thirty miles up Highway #11. For a number of miles, this route runs alongside Helen Lake, with its smooth rock vistas that locals call “scramble rock” - great places to scramble around on. The road’s most dramatic section is through the Pijitawabik Palisades, an awesome area of high mesas and waterfalls on one side of the road and lakes, the last being Nipigon, on the other. This area is known as “Little Scotland” for its uncanny resemblance to parts of the highlands of Scotland. As the highway is the only east/west route for truck traffic, drive carefully. If you want to “rubber neck”, pull off the road. The Nipigon area is a hikers paradise. Write for a complete list of the trails that are brushed and open. One of the most popular, the Red Rock Trail, connects with the Nipigon River Trail. Definitely set time aside to hike to Ruby Lake for a spectacular view from the mesa’s rim over mountains and valley. Although not on a brushed trail, Cash Lake Canyon, is a wild, hard-to-get-to mysterious place where its reputed the water is purple and birch trees have a mauve tint as they pick up the colour through their roots. From Nipigon, a drive up Highway #585 reveals hydro electric dams and power plants on the Nipigon River that rival any in southern Ontario. And you won’t believe the size of the salmon in the river! Looking for accommodation in Nipigon? Hang your hat at the Northland Motel. Nipigon Café on Railroad Street serves good food. Ouimet Canyon lies a short distance west of Nipigon. Part of the drive on Highway #11/17 passes through a huge area of mature white birch. Signage for the attraction is at a premium so keep your eyes open for a small blue and white sign that says “Ouimet Canyon Park.” The road turned to the right off Hwy #17, just before a highway bridge. If you cross the bridge, you’ve gone too far but the natural phenomenon is worth turning around for. Ouimet Canyon is six miles off the highway but the road in is paved and easy to drive. The canyon floor is 345 feet deep and nearly five hundred feet wide. Sub-Arctic plants thrive in the canyon’s lower reaches as the climate is cooler than that at the top. A hiking trail leads from the parking lot to over-look platforms where you can view the canyon’s walls stretching into back country to the north, and opening to the wide plain of the Superior shore to the south. Be aware that viewing platforms are not for the faint-of-heart, those people afraid of heights! Indian Head near the second lookout area is one of the most photographed formations in Ontario. Not too far west of Ouimet Canyon, you’ll begin to see signs advertising amethyst mine tours. One of the best mines to visit is Amethyst Mine Panorama, on East Loon Road. Signage is good and the drive into the property goes through some great Canadian shield country. Amethyst Mine Panorama is forty-two-years-old and contains the largest deposit of amethyst in North America. The semi-precious gem-bearing fault is approximately 1,200 feet x 40 feet and has enough product for another seventy-five years of extraction. For a reasonably-priced admission, you are given the opportunity to tour the mine and to find your own stones, in a five acre rubble field, that you can purchase for $2.00 a pound. You have to listen carefully to rules and regulations when visiting this mine. If finding your own amethyst is not an option, samples, large and small, can be purchased. Did you know that amethyst can be brown, purple and red, all a result of iron that leached from mudstone as the semi-precious stones formed millions of years ago? Sleeping Giant Provincial Park, a few miles off Highway #11/17, includes camp sites, easy and difficult hiking trails, and a four-mile drive to one of the most dramatic over-looks in Ontario! The lookout, positioned on the mesa that is Sleeping Giant which is at least 1,200 feet high, overhangs the cliff face and has a slatted floor. Views are absolutely spectacular if you can bring yourself to walk to the end of the platform. The small summer community of Silver Islet, with its historic c1871 country store is located at the end of the drive to Sleeping Giant Provincial Park. At the beginning of the twentieth century, one of the richest silver mines in North America was located on an small island just offshore, hence the village’s name. There’s one little thing you should know about Sleeping Giant. When you visit the park, you are actually on the gigantic rock formation known as the Sleeping Giant so you can’t see it. The best views of Sleeping Giant’s miles of mesa, can be had from lookouts and parks in the city of Thunder Bay. For accommodation outside the city of Thunder Bay, try McKenzie Inn, located three miles west of the road to Sleeping Giant Provincial Park and just east of Thunder Bay’s city limits. The completely renovated and restructured c1920's building has lovely bedrooms, a coffee shop, lounge and dining room with attractive fireplace made of local stone. There are miles of trail on the property, an extensive beaver pond and two swimming holes on the McKenzie River. Looking for a rockin’ experience? Drop in at Thunder Bay Agate Mine on Highway #527, a mile or so off Highway #11/17, three miles east of the city. Agate is a semi-precious gemstone with a hardness of 7.5. Thunder Bay Agate Mine, the only one in Canada, boasts the largest agate in the world. Take a tour of the cutting, polishing and manufacturing area, located at the gift shop then make your way to the open pit mine. A knowledgeable guide comes in handy at this mine. The amount of agate to be seen and found is amazing. In certain areas, pointed out by the guide, you can choose stones, pay by the pound, have them polished and own a great souvenir of the Canadian Shield. The city of Thunder Bay was formed by the amalgamation of a number of communities - small and large, among them the cities of Port Arthur and Fort William. Located on the shores of a bay formed and protected by the Sleeping Giant rock formation, Thunder Bay welcomes ships from around the world who have negotiated the St. Lawrence River and locks on the Great Lakes to reach the most westerly Canadian inland port. The eastern edge of Thunder Bay is the site for one of the most poignant monuments in Canada, the Terry Fox Memorial. The cross-Canada Marathon of Hope undertaken by this courageous young man ended near Thunder Bay when his cancer flared again. Terry Fox continues to be an inspiration for people, young and old as a Terry Fox Run is held in communities across Canada each year in September to raise funds for cancer. Sleeping Giant can best be seen from Hillcrest Park on High Street and from the lookout on Mt. McKay. As Mt. McKay is located on reservation land, it is appropriate that it have an Ojibway name, Animiki wadjiw - Mountain Abode of Thunder. Throughout the north, two native languages are prevalent Oji-Cree and Ojibway, reflecting the First Nations tribes that call this part of Ontario home. A number of wood sculptures, honouring First Nations ancestors, are displayed near the lookout and a small stone c1885 chapel sits at the base of the mesa. No visit to the area is complete without visiting “Niagara of the North”, Kakabeka Falls, a 128 foot waterfall on the Kaministiquia River, seventeen miles west of Thunder Bay. 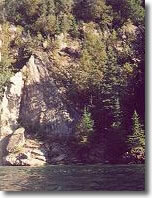 Appropriately, the word “Kakabeka” means “water running over sheer cliffs”. Indeed, water thunders over sheer cliffs into an impressive gorge before flowing to Lake Superior. 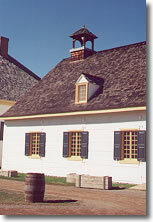 Old Fort William, a recreated North West Company Trading Post, located on the lower Kaministiquia River, near Thunder Bay, is well worth a visit. The attraction consists of forty-two buildings on twenty-five acres. Its interpretation period is c1815. Costumed guides rarely fall out-of-period and characterization. During high season, mid-May through mid-October, activities are scheduled in various parts of the fort every half hour. Other area attractions include Thunder Bay Art Galley with an extensive native Indian art collection, Magnus Theatre with its professional theatrical presentations, Friendship Gardens where all the nationalities that make up Thunder Bay are represented through creative monuments & flower beds and the revitalized waterfront area with its boutiques, restaurants and hiking paths. In Thunder Bay, everyone eats at the Hoito Restaurant, located in the basement of the Finlandia Club on Bay Street. The building is an excellent example of early 1900's commercial architecture. As many bachelors came to this part of Lake Superior from Finland, the Club gave them a place to meet and eat. Try the very thin Finish style pancakes. Slather with butter, roll up and eat. Mmm good! Hoito’s pork chop, liver & onions and salt fish dinners are good too. Enjoy a meal at the Caribou on Hewitson Street where smoked salmon pizza, roasted halibut and maple glazed salmon entrees reign supreme. For a “just plain folks and food” experience, seek out The French Frier on Balsam Street for some succulent Chester Fried Chicken and chips. Planning to spend some time in the area? One of the best places to stay a few days is at Mink Mountain Resort, a half-hour south of Thunder Bay on the shore of Lake Superior. Rent a lake-side home for a week or two. Enjoy fantastic sunrises from your own deck. Take a leisurely paddle along the shore. Relax in your private outdoor hot tub as a magnificent moon rises over the lake. Before undertaking any trip, write for a comprehensive package of information. During high season, accommodation reservations should be made in advance. Driving distances are long in northern Ontario, so plan your itinerary to allow plenty of time to enjoy the beauty of the Canadian Shield and its many communities at leisure. If you don’t feel like doing all that planning, contact Lake Superior Visits, 2021 Oliver Road, Thunder Bay, Ontario, P7B 6C2. www.superiorvisits.com For a fee, Lois and her capable staff will do an excellent job of putting an itinerary together, and making all arrangements for you.